“Baja” project, finally completed after a year of hard work and dedication, it was made to show and share with you the amazing and beautiful creatures that inhabit its waters. These beauties are still there, but most threatened. Many fish stocks have been depleted due to uncontrolled illegal fishing worldwide, especially in breeding and marine protected areas. Sharks are key species on our planet that regulate marine ecosystems, maintaining healthy populations and good gene flow, if they are removed from the seas would cause an alarming unbalance in all marine ecosystems. Unfortunately shark populations worldwide are being systematically destroyed due to demand from Asian countries to produce ¨shark fin soup" and other shark derivatives, supposedly pseudo-medicinal and aphrodisiacs. Every year, more than 70 million sharks are killed to produce the shark fin soup. Mantas, which have roamed the ocean for over 150 million years and are a kind close to the heart of each and every diver who cares about the future of our ocean, are increasingly endangered and yet we are witnessing the ecocide. Demand of Asian medicine markets for gill rakers or internal structures that Mantarays use to absorb oxygen from the sea and also they filter plankton on which they feed, has increased dramatically, leading to countless deaths. The gruesome and cruel destruction of these gentle creatures is unnecessary, tragic and extremely alarming. It is imperative that we act quickly to protect marine species populations that still prevail before it's too late, there is still time to act and it is our responsibility if we don´t want these beauties disappear, if we want our children also get to know them. Awareness is up to you. Arrr, sail west from the Florida Keys to the Tortugas, me hardies, and ye will find the finest fishing in all the seven seas, says I. But beware, only a scurvy pirate would dare fish the forbidden waters of the Tortugas Ecological Reserve. The Tortugas islands used to be a sanctuary for the pirates of the Caribbean. Now, the waters around the islands are a 151-square nautical mile sanctuary for fish, where commercial and recreational anglers are forbidden. The National Oceanic and Atmospheric Administration’s research found that the Tortugas Ecological Reserve hasn’t cost fishers any gold. Indeed, increased fish numbers around the reserve have filled anglers treasure chests with more fishy booty. “This research shows that marine reserves and economically viable fishing industries can coexist,” said Sean Morton, Florida Keys National Marine Sanctuary superintendent, in a press release. Dry Tortugas National Park is a remote park about 70 miles west of Key West, Florida. It encompasses a cluster of seven islands including historic Fort Jefferson and surrounding coral reefs. This ten minute video introduces visitors to fundamental trip planning to get to and enjoy this amazing place. Since the reserve was designated in 2001, regional commercial fishery’s harvests have increased from an estimated value of $40 million in 2001 to $56 million in 2011. What’s more, since the reserve helps keep fish numbers high in the Florida Keys, it protects approximately 33,000 American jobs that depend on marine tourism and recreation in the Keys. Humans aren’t the only winners in the reserve. Annual spawnings of mutton snapper (Lutjanus analis) were thought to have been wiped out in the area. Now, the breeding events have returned in the reserve. Overfished species, such as black grouper (Mycteroperca bonaci), red grouper (Epinephelus morio) and yellowtail (Ocyurus chrysurus), have also increased in population numbers and physical size. Estimated to be the most pristine marine reserve in the world, Cabo Pulmo, a coral reef in the sea of Cortez, between Mexico and Baja California, is threatened by plans to construct a 27,000-room hotel. The community has mobilised to stop the project. 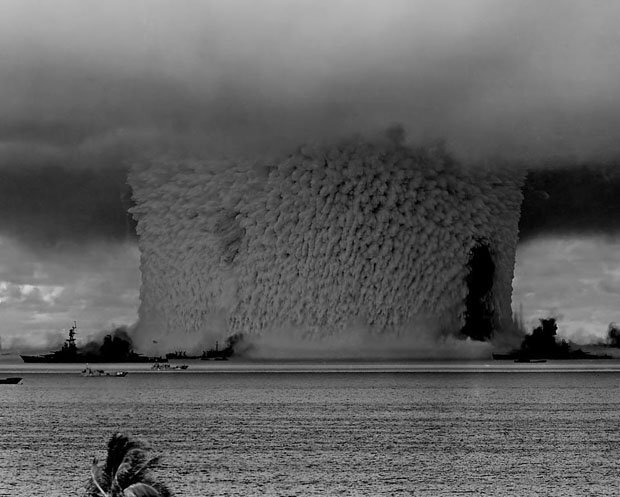 Mushroom-shaped cloud and water column from the underwater Baker nuclear explosion of July 25, 1946. Photo taken from a tower on Bikini Island, 3.5 mi (5.6 km) away. called Baker "the world's first nuclear disaster." 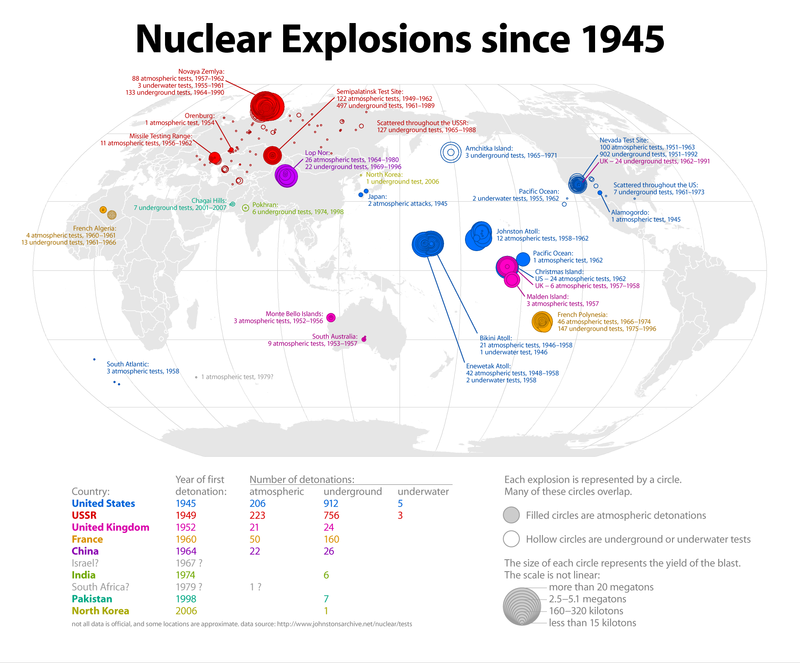 In in 1946, the United States conducted a series of nuclear weapon tests at Bikini Atoll in what’s known as Operation Crossroads. All 167 native residents were moved 128 miles (206 km) east to the uninhabited Rongerik Atoll. A total of two bombs were detonated to test the effects nuclear blasts had on naval warships. The second, named Baker, was the world’s first nuke to be detonated underwater. Due to the unique properties of underwater explosions, the Baker test produced a number of unique photographs that the world had never seen before. The blinding flash that usually obscures the target area took place underwater and was barely seen. The clear image of ships in the foreground and background gives a sense of scale. The large Wilson cloud and the vertical water column are distinctive Baker shot features, making the pictures easily identifiable. The photograph above is an eerily beautiful image shot from 3.5 miles away showing the massive vertical water column. Here’s a crop to give you a better sense of scale. That black thing on the right side of the column is one of the massive ships being lifted into the air. The blast lifted two million tons of water and sand into the air, creating a column 6,000 feet tall, 2,000 feet wide, and with walls 300 feet thick. Crossroads Baker, showing the white surface "crack" under the ships, and the top of the hollow spray column protruding through the hemispherical Wilson cloud. Bikini Island beach in the background. The Wilson cloud has evaporated revealing the cauliflower atop the spray column. Two million tons of water spray fall back into the lagoon. The radioactive base surge is moving toward the ships. 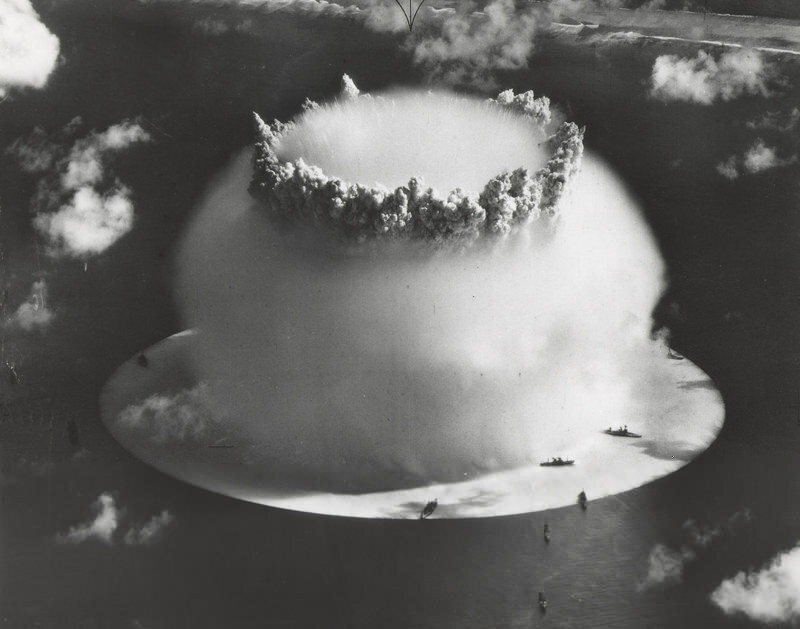 A 1946 test of a 23-kiloton nuke, named "Baker", 27 meters underwater. This was part of Operation Crossroads. The tidal wave from the blast rose over 2 miles high. The most vivid historical meteotsunami on record in the Great Lakes occurred in 1954, when a squall line-induced longwave wave struck Chicago in Lake Michigan. The coast was inundated up to 50 meters inland and unexpectedly swept many fishermen off of the Montrose Harbor piers, killing seven. While the threat of meteotsunamis in Lake Michigan has been recognized, to date no infrastructure for detecting and warning of a pending meteotsunami disaster is available. A freak wave killed seven people in Chicago on a sunny day on the shore of Lake Michigan nearly 60 years ago. At the time, no one knew what set off the monster wave. Researchers now know the wave was a pressure-driven tsunami, stirred up by storms passing earlier in the day, said Chin Wu, an engineering professor at the University of Wisconsin, Madison, at last week's annual meeting of the American Geophysical Union. Called meteotsunamis, the weather-related waves strike frequently in the Great Lakes and along the U.S. coastline. The 10-foot-high (3 meter) wall of water that hit Chicago was one of two recorded in Lake Michigan in June 1954. An 18-foot-tall (5 m) wave took out cars in Daytona Beach, Fla., in 1992, and a 12-foot-high (3.5 m) surge poured into Boothbay Harbor, Maine, in 2008. The largest of these waves can reach a height of about 13 feet (4 m), such as the fatal meteotsunami that struck Nagasaki Bay in Japan in 1979. Along with loss of life, the waves have caused millions of dollars in damage to boats and harbors around the world. The United States is funding efforts to better understand and predict the killer waves, which may be more common than once recognized, said Paul Whitmore, director of the West Coast and Alaska Tsunami Warning Center. "If you look back historically, there's several on the East Coast that have done damage and injured people throughout the past number of years, so that was our motivation to move forward to being able to actually forecast these," he told OurAmazingPlanet. Spain and Croatia, countries whose narrow harbors enhance the severity of meteotsunamis, already issue general warnings. A meteotsunami forms when a storm slams the water's surface with a burst of pressure. Over the open ocean or a large lake or sea, a sharp jump of 2 to 10 millibars can start a wave (or make your ears pop). Squall lines of thunderstorms and gravity waves (oscillatory air patterns) can also unleash meteotsunamis. But to sustain the wave, the pressure jump must also be accompanied by resonance — the weather front or disturbance needs to travel as fast as the wave to feed it energy. The storm can pass hundreds of miles or kilometers away from shore, yet form a tsunami with enough energy to cross the ocean. Once the wave has enough energy to travel to shore, the tsunami needs to hit a bottlelike or V-shaped harbor or bay where it can quickly gain height and rush the coast. The narrow harbors amplify the waves by reflecting, or oscillating, the wave back and forth. The term meteotsunami was coined in 1996, but awareness of the waves dates back to the 1950s, said Alexander Rabinovich, a research scientist at the Shirshov Institute of Oceanology in Moscow. The advent of weather satellites and armies of buoys monitoring pressure changes across the ocean surface, combined with a marked interest in tsunamis following the deadly 2004 Sumatra earthquake, has galvanized research in the phenomenon, he told OurAmazingPlanet. Unlike earthquake-generated tsunamis or hurricanes, storm-driven waves won't devastate an entire continent's coastline. They slosh about in narrow harbors and bays. But what makes them so hazardous is their tendency to appear on sunny days, spawned from storms hundreds of miles away. Footage of what was reported as a mini tsunami and meteotsunami in Britain. Taken on the morning of 27 June 2011 at the Yealm estuary, Devon. "A big wave comes in and you're on the beach and maybe you think, 'Hey, a big ocean liner just went by,'" said David Tappin, a marine geologist with the British Geological Survey. "But increasingly, people are looking at historical records and at the meteorological information we have, and people are realizing this is more of a hazard than we previously thought." Tappin and his colleagues identified the first recorded meteotsunami in Britain, using satellite imagery, pressure buoys and several YouTube videos. In a feat of CSI-level sleuthing, they verified the wave was a meteotsunami by backtracking in time from when it arrived on the Cornish coast, in the Yealm Estuary. The researchers resolved everything from the culprit storm in the English Channel to finding the crime scene: the buoy recording the 5-millibar pressure jump where the wave began. At the AGU meeting, Tappin showed a YouTube video of people walking through rapidly rising water to St. Michael's Mount in Cornwall as the sun shines. "You have the source hundreds of kilometers away, you have no geological indication of shaking, but suddenly you can get a big wave coming in, so [meteotsunamis] are quite dangerous from that point of view," Tappin told OurAmazingPlanet. With the world's winds growing faster and wave heights increasing because of a changing climate, and storms predicted to become more intense in coming years, Tappin is concerned that Britain is at risk for more meteotsunamis. "With global warming, we're going to have more of these events. One of the recommendations of this study is that we look at whether this is going to be an increasing hazard for Britain, because we've never had one of these before," he said. Seiche's are sudden waves or rises in the sea level. They are thought to be created by atmopsheric conditions. A sudden change in the pressure thought to push the wave or mass of water towards the land. These waves can cause severe flooding and loss of life. While there is great interest in predicting meteotsunamis before they strike, the interplay between the atmosphere, the ocean and the shape of a harbor makes it difficult to accurately estimate a wave's size at present, said Sebastian Monserrat, a physical oceanographer at the University of the Balearic Islands in Spain. "When you have an earthquake, the earthquake just stops, so you get information on the wave before it reaches a hot spot," like a harbor, he told OurAmazingPlanet. The narrow harbors of Spain's Majorca Island and Croatia, along the Adriatic Sea, are especially prone to meteotsunamis, Monserrat said. "The meteorological office in Majorca is giving a warning when the atmospheric situation is likely to produce these meteotsunamis, and that is working, but the problem is that this is not the most important thing," he said. "It's not just to know that they're going to happen, but to know how large they're going to be. And this is what we're trying to improve." 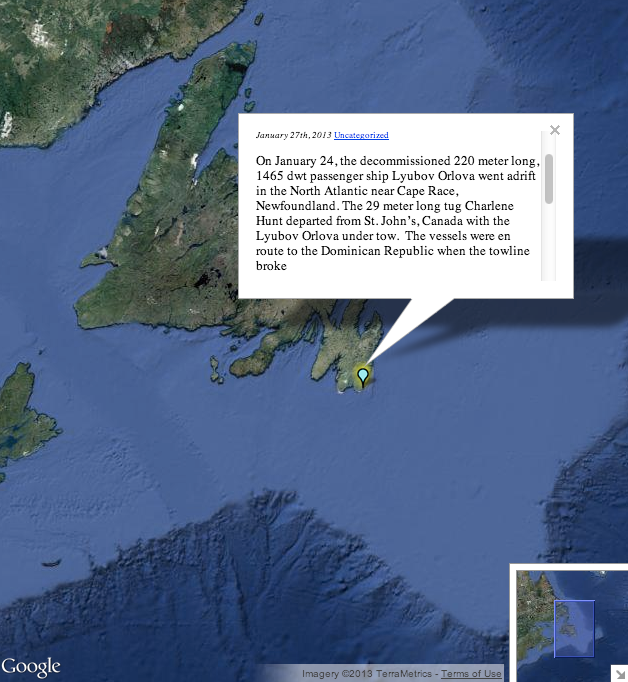 is drifting 600 kilometres northeast of St. John’s for ports unknown. and it was then decided to let it drift away. The unknown location of the MV Lyubov Orlova is now being used as a way to test the ability of a new system of marine monitoring called the Global Maritime Awareness system. Guy Thomas is a retired former science & technology adviser to the U.S. Coast Guard and has been involved in maritime surveillance for more than 40 years. In 2005 he had an idea that if the countries of the world combined their technologies and everybody banded together, a global maritime awareness system could be established that would allow for greater monitoring of the marine environment. The idea is based on the four types of satellites that exists, says Thomas, each of which offers a different type of data. The Automatic Identification System (AIS) is an automatic tracking system used on ships as a means of collision avoidance. It’s used for identifying and locating vessels by electronically exchanging data with other nearby ships. “It was designed for ships in the immediate vicinity of each other and control points in harbours to be able to reach out and signal to a specific ship,” he says. Information such as a ship’s position, speed, course and even the captain’s name can be shared back and forth between vessels. That tried and true method of sharing information lit a spark in Thomas’ mind. The Lyubov Orlova has left port. After being delayed a day by a storm, the ship was towed out through the narrows of St. John's harbour on Jan. 23, 2013. That was done and a second satellite system was created that provides radar information from space. It expanded on the ship-to-ship ability of the initial idea allowing for vessel information to be shared over larger areas. The third satellite type is probably the one that people are most familiar with — the ones that take pictures. “There’s been an explosion in that technology in the last five years, as well,” says Thomas. The imaging systems have a big downfall though, he adds. They can’t operate at night and they don’t operate through clouds. That is the advantage of the radar systems. They operate in both those conditions. The fourth type of satellite data involves a small box on ships that sends information to satellites in space. It tells a ship’s location and even some conditions on the ship. This became known as Long Range Identification and Tracking or LRIT. Ships have to report into the governmental authority of any country they’re going to pass within 2,000 miles of, says Thomas. All ships have to report on LRIT four times a day and companies use it to track their assets on ships. Those four satellite systems, combined, Thomas says they would make for a very effective tool of monitoring marine environments for illegal activity, including such things as polluting and smuggling. “If you meld those together you could come up with a system to allow you to improve security of your shores,” says Thomas. So how does the drifting Lyubov Orlova fit into all this? 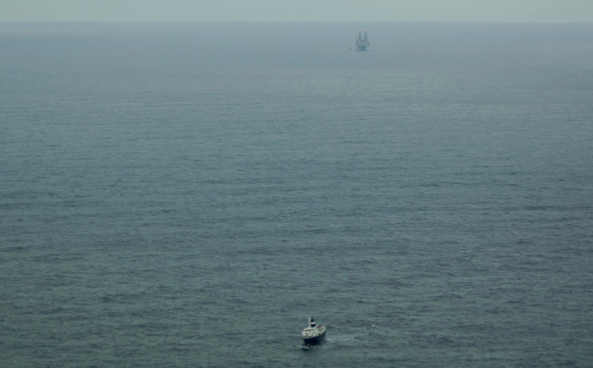 Well, it’s a dead ship who’s location is unknown and even with the knowledge of current patterns, it’s a big ocean out there. Using a combination of the types of satellite information available will test the notion that cooperating and sharing technologies will result in a Global Maritime Awareness system far superior than any individual system. Thomas, who lives in Baltimore, actually saw the Orlova tied to the wharf in St. John’s while he was here December past giving a presentation to the National Research Council’s Institute for Ocean Technology on his idea for a Global Maritime Awareness system. However, he found out about the ship’s current state of affairs through the Irish Coast Guard, with whom he also has dealings. Thomas says that Chris Reynolds, the director of the Irish Coast Guard, had mentioned to Thomas that he had serious concerns about a dead Russian cruise ship that was heading toward his country from Canada, and that he didn’t want his country to bear the burden of it coming aground in Ireland. Thomas suggested they use his method of combining different satellite data to find the location of the ship. Of course, the drifting Orlova isn’t going to be sending signals to satellites the way an active ship would be, but sometimes what a ship doesn’t send out lets you track it too, says Thomas. If they know they’re are so many ships in an area from a satellite image and they can tell one of those ships isn’t transponding through the AIS system, then that’s a little curious, he says. They’ll find the Orlova by scratching out the vessels that are sending out data through the satellite systems. You’re left with the dead ship. It’s a process of elimination and it works in keeping the marine environment safe from illegal activity, too, says Thomas, since those ships breaking the law won’t be responding either because they don’t want to be tracked. 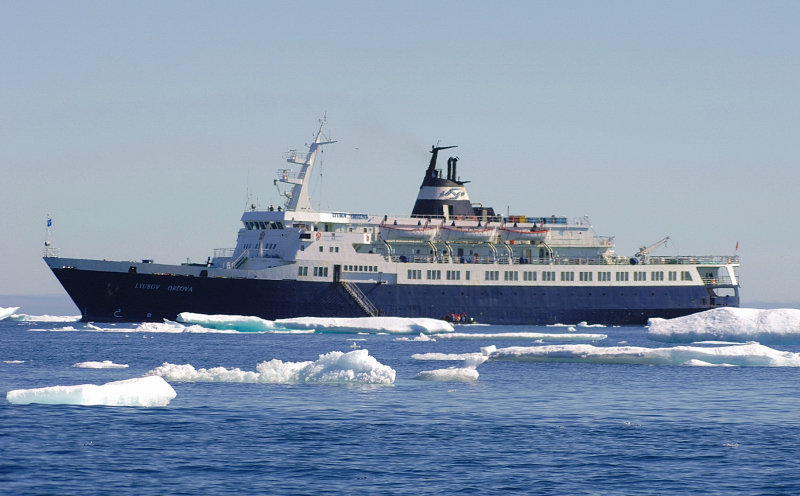 They want their location to be as mysterious as that currently of the Lyubov Orlova. Thomas is now in collaboration with the Irish Coast Guard to track the ship through these methods. 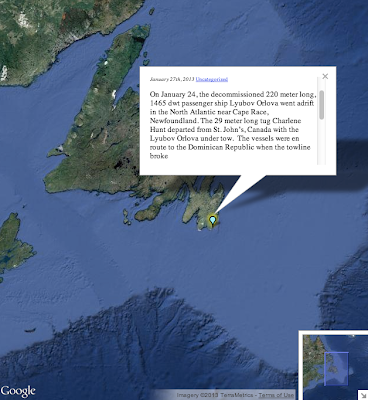 They know the last position of the Orlova as taken by Transport Canada before the vessel went A.W.O.L. and by studying ocean currents, they can come up with an idea of where they think the vessel might be. Then, by using various types of satellite information, they can get a read on how many ships are in that area and if any aren’t transponding. The challenge was not just taken up the Irish but also by an Italian company called e-Geos, which specializes in Earth observation and in geo-spatial application. They, too, took the last location of the Orlova, and by taking ocean currents into consideration came up with a location, they felt should be where the ship is located. Then they got a satellite image of the area. And they got a hit. There’s something they found south southeast from the tip of Greenland, says Thomas, that has some probability of being the Orlova, though that’s not written in stone as of yet. The company is going to get more images over the next few days to see if they’re really onto something. Regardless if this it or if they have to have to keep searching, Thomas is confident in his method working and working punctually. “We are going to find it. Before it ever approaches Ireland we will be able to tell the various navies where it is,” he says. His plan then is to also give the location to the ship’s owner, Reza Shoeybi. The beauty of the Bahamas is surreal; every blue that exists. Where is the picture ? to be the first to find the location, so winning one year of Premium access. attention turns to the constant state of development for both sailors and shore crew alike.